String quilts are pretty fantastic. 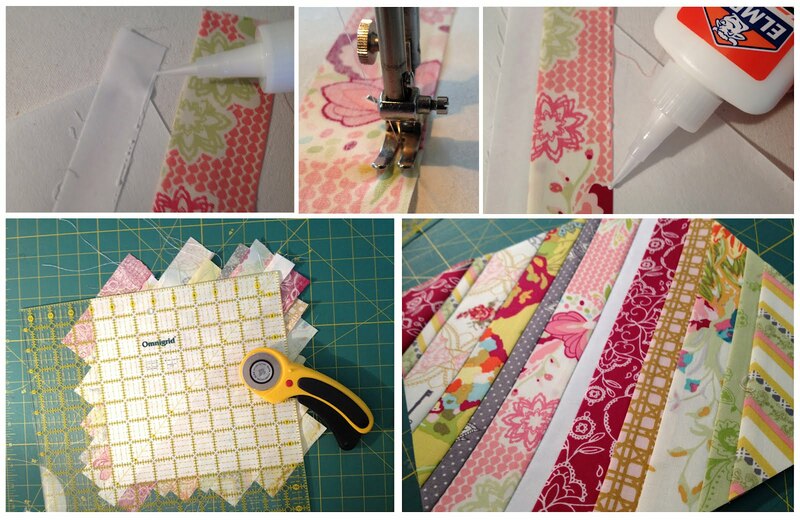 They're so much fun to make, a great way to use up scraps, and can help build a lot of confidence if you're just beginning to learn to piece and quilt. How to make a string quilt isn't new, and there are lots of other great tutorials out there. I learned how to make my first one from a blog I adore: Film in the Fridge. I use a similar foundation piecing, aka paper piecing, technique, except for one VERY important part that I changed. I don't use paper. Are you shocked? Well, not regular paper, anyway. 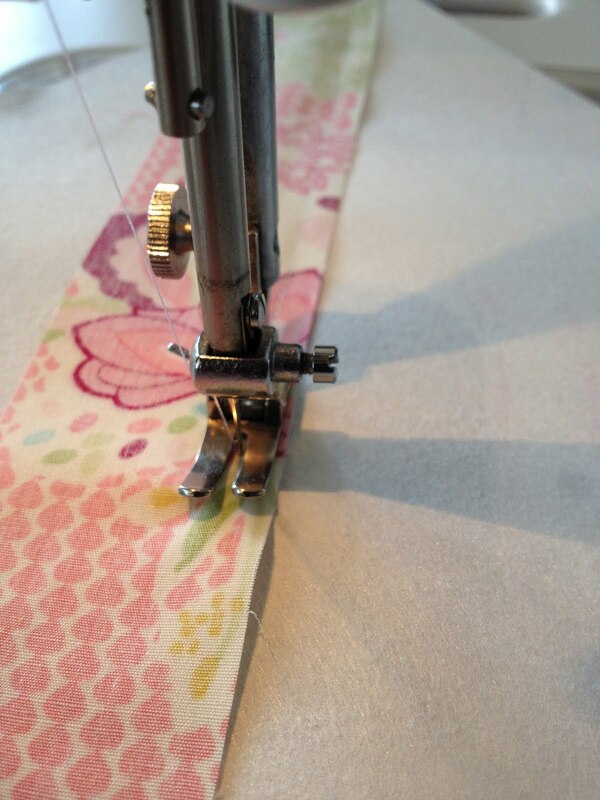 I use the same applique foundation that I use for my turned edge applique. Which means, NO tearing the paper off at the end. Once you trim your block square, you're done! When your quilt is complete, and washed, the fibers of the foundation bury themselves in the batting, and your quilt is soft and wonderful. I think you're going to love doing string quilt blocks this way. 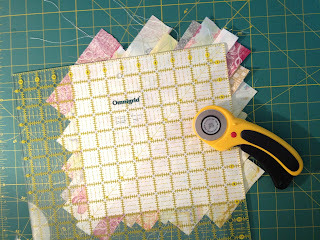 Are you ready for some paperless paper piecing (as my mama fondly calls it)?? I'd like to tell you a little bit more about the foundation paper that I'm using. It's a product that my mom, Sharon Schamber, and I have been using for machine applique for many many years. It has helped change how many appliquers do their work. Those who use our technique have more accuracy, work with ease, and don't have to cut out the back of their applique pieces to remove other types of foundations. This foundation simply stays in the applique piece. 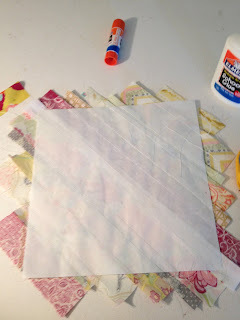 Most string quilt tutorials, that I've seen, use printer or scrapbook paper as the foundation paper. There is a downnfall: it all has to be torn away before you can piece the blocks together. I hate tearing the paper away. It can take a lot of time. 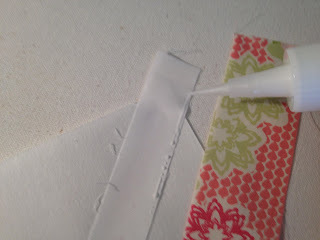 Also, you always run the risk of distorting your blocks when you tear the paper away from the seams. Using this foundation paper eliminates tearing it away. It stays in, which helps keep your block measurements more accurate, and helps you finish faster. I love efficiency!! After you wash your quilt, the foundation becomes soft, and the fibers blend in with the batting. Oh, and it's really easy to quilt over! Bonus!! Now you can cut your foundation paper to size. You can really go with any size block, for string quilt blocks. I've seen amazing 12" blocks, and super cute 6" blocks. I'm using a 9" block, here. 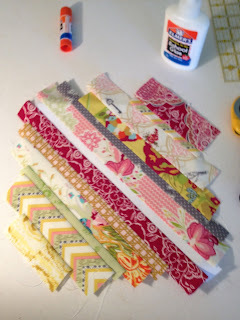 Next, cut up some strips of fabric: multiples of 1", 1.25", 1.5", 1.75, 2", and maybe even 2.25" strips. 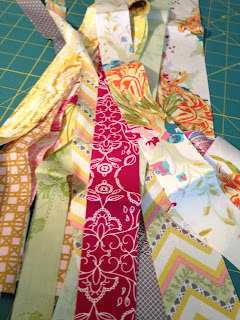 There's a lot of flexibility here to be super scrappy, or to plan out the color order of the strips in the blocks. This, of course depends on you and your personality. In addition, you'll need 1" strips of your center stripe color (you can make them wider, of course). I chose white for mine, but you can easily go with any color you wish. Can I just tell you how amazingly soft and lucsious Bari J's Lilly Belle is? Good quality fabrics make a huge difference. They can make your projects look better, and make them more fun to make (and finish, lol). Once your strips are cut, take one of your white ones, and measure it along the diagonal center of one of the pieces of foundation paper. Trim it about an inch too long on each end. You can go ahead and cut all of your white strips this same length, as their length won't change. Now, glue it on down. 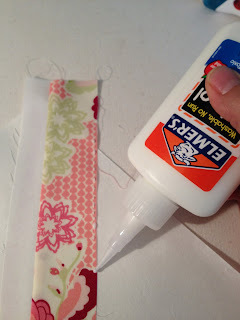 I use Elmer's Washable School Glue sticks. They start out purple, and turn clear when dry. By far, they are my favorite anytime I need a glue stick for any quilting or sewing project. Heat set it with a hot, dry iron. With this glue stick, you'll see a bit of purple show through the strip. No worries though, it will be clear once it cools off. Are you ready for my next little twist?? I rarely use pins when I piece, whether it's regular piecing or foundation piecing. I prefer using Elmer's Washable School Glue as a basting glue. I attach a fine tip to the top, apply the glue and heat set it. It works like a charm! Everything stays where it's supposed to, and there's no shifting when I sew them up. Also, I drastically reduce the risk of poking myself with pins, or sewing over them and breaking a needle on my sewing machine. I think you'll really like this way of piecing, without pins. Apply a line of glue close to the edge of your white strip. Carefully place your first strip on top of the white one, right sides together. Be sure align the edges of both strips. See how the glue is on th edge of the fabric, and not really on the sewing/seam line? 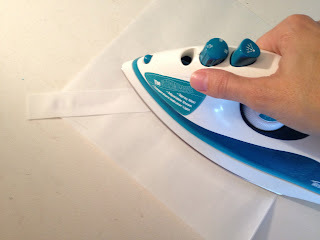 Heat set the glue with your dry iron. Sew it on up! Use a 1/4" seam allowance. Often with foundation piecing, you have to reduce your stitch length so you can tear the paper away more easily (hopefully). No need here. You can keep your usual stitch length. I like 2-2.5. 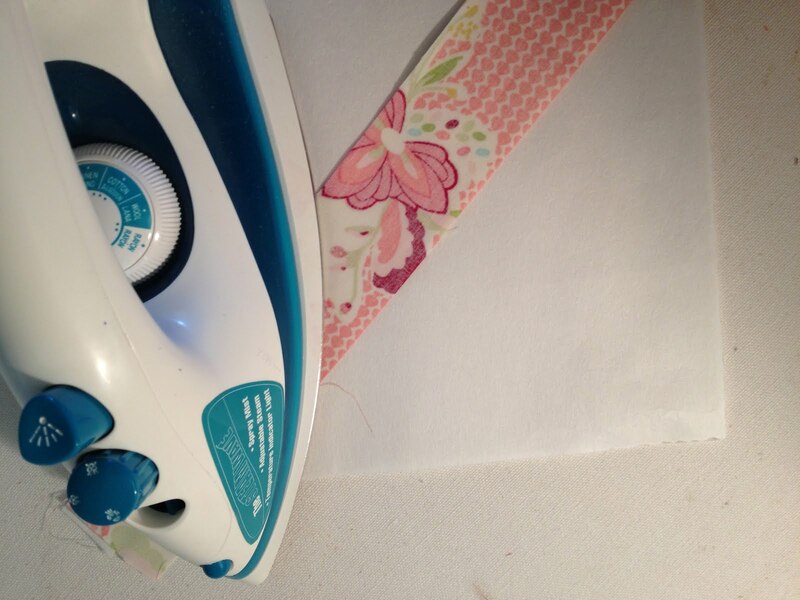 Press the strip open with a dry iron. Apply another line of glue to the edge of the strip, align the next fabric strip, right sides together, heat set, sew, and press open. 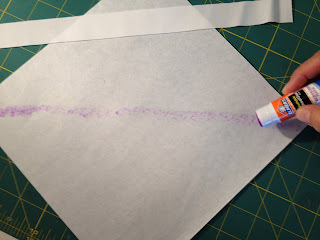 Repeat the process with the rest of your strips, to fill up the entire piece of foundation paper. Remember to heat set your glue! This makes all the difference in the world. Now you're ready to trim it up. Use your ruler and cutter to cut right along the edge of the foundtion paper, while keeping the same block measurement that you started with. Now that it's all trimmed up, it's ready for a bigger and better project. I have something in mind for this little beauty. I'm sure it'll be up on the blog soon! You can stop here, with that block, and continue making more string quilt blocks. 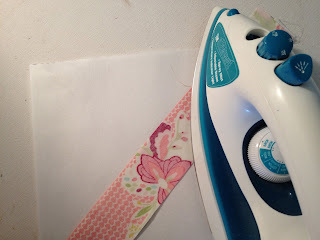 This technique is also great for chain piecing. You can easily prep multiple blocks, and their strips, and sew a bunch up at a time. Also, once you get beyond the first two or three strips, you can prep the strips on both sides of the white stripe, at the same time. Glue the next strip on the right side, then the next on the left, heat set, then sew them up. I really hope you enjoy this technique, and share it with your friends. I love sharing my little tricks and tips, and am always here to help.